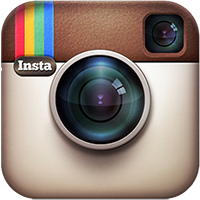 I am the artist and owner of Juleez. Thanks for visiting my website and being curious about my artwork. Shop the Gallery of Hand Painted Violins for sale. Available with violin and display stand or send in your violin to be hand painted. All brands are available. Choose a design or request a custom design by Juleez. These are just Cool! What a piece to play in front of an audience, your music video or band. Check out the Collection of Hand Painted Saxophones. Shop The Gallery of Hand Painted Trumpets Cornets, Trombones and French Horns by Juleez. Order a hand painted horn by Juleez or send in yours to be painted. Hand Painted Limited Edition Miniature Saxophone Musical Instrument with stand and case. Each of these 6.5" detailed saxophones is painted one at a time to order by artist Julie Borden of Juleez making each one a unique collector item. Fantastic gift for saxophone players, jazz music lovers, miniature collectors and music rooms! Each case is hand signed by Juleez and each box is numbered in the edition. Features a metal display stand and unique red velvet collector box. Free shipping! Saxophone measures 6.5" Height x 2.5" Width and 1" Depth. 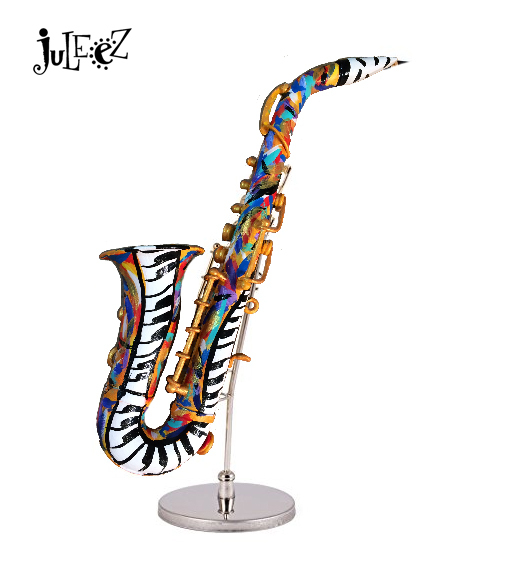 *Please allow 10-14 days to receive your mini sax, as each is hand painted to order. Visit the Cello Gallery and Watch The Piano Guys Music Video featuring Juleez Hand Painted Cello created just for the video. 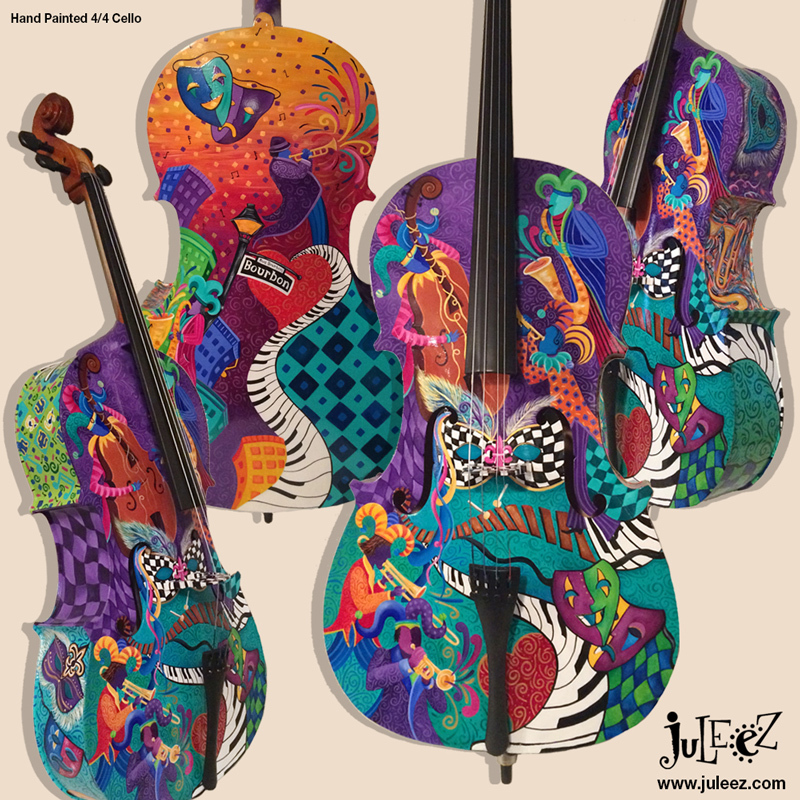 Juleez offers several designs on cellos for sale or request a custom design to be created just for you. Have your own cello? 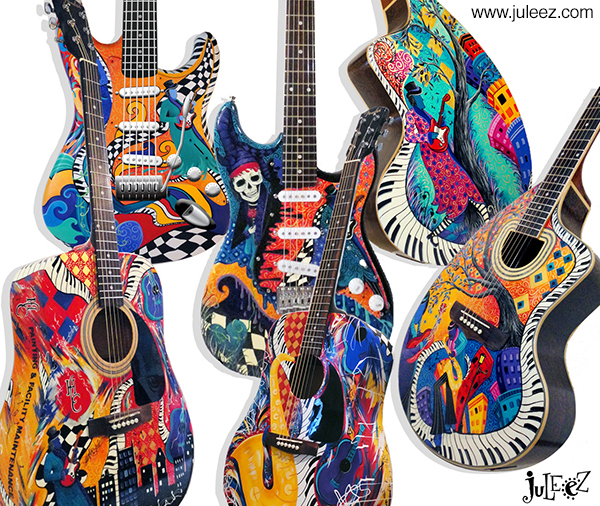 Send it to Juleez for Custom Painting and have your one of a kind musical work of art created.